It's easy to be intimidated by even the most basic of home repair needs ! Finding the right tool, knowing how to use it, and even discerning the problem can be a challenge for many homeowners. Often, giving in and making that $200 phone call to the plumber is only all to easy. Finally, a course to help you achieve a degree in DIY. Al Carrell and his daughter Kelly Carrell have teamed up to create a book to take the all thumbs freshman DIY'er and teach him or her the basics, and then lead them into more advanced projects. Each project has easy to understand step-by-step instructions including a list of tools and materials needed. 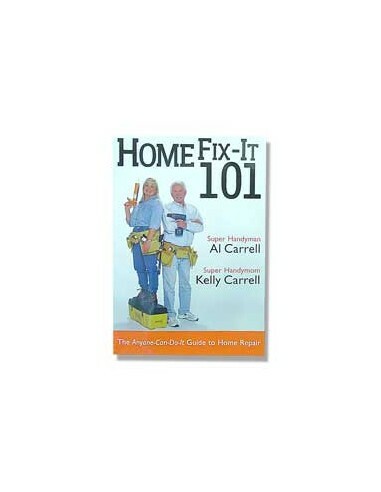 This book is a MUST for the beginner or the advanced home repair person. Perfect for Homeowners. Al Carrell was Home Depot's official spokesperson for 8 years. Al co-founded and is regularly featured on "Your New House". He has been writing the syndicated column "Super Handyman" for more than 3 decades. Al is the host of a home repair show that has run for 15+ years. He has appeared on NBC Today, Good Morning America, Home Matters and Our Home. He has written seven books on home repair including the best selling "The Superhandymans' Encyclopedia of Home Repair Hints" which was a Popular Science book club selection. WHILE SUPPLIES LAST - EACH BOOK PERSONALLY AUTOGRAPHED BY AL & KELLY CARRELL !